It’s a classic dilemma for downsizers who don’t want to give up luxury: Is it worthwhile to compromise on square footage for a maintenance-free lifestyle? Enter the newly released Foxbar Collection, part of the 26-storey Blue Diamond condominium development. It offers many expansive suites and six lavish three-storey townhomes on Foxbar Avenue at Avenue Road and St. Clair Avenue West. 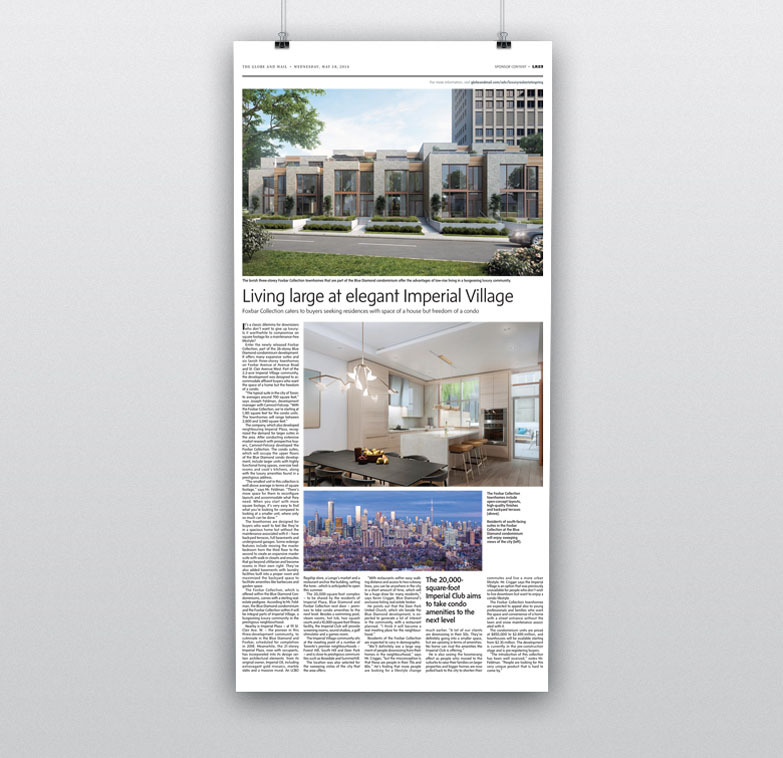 Part of the 2.2-acre Imperial Village community, the development was designed to accommodate affluent buyers who want the space of a home but the freedom of a condo. The company, which also developed neighbouring Imperial Plaza, recognized the demand for larger suites in the area. After conducting extensive market research with prospective buyers, Camrost Felcorp developed the Foxbar Collection. The condo suites, which will occupy the upper floors of the Blue Diamond condo development, include larger units with highly functional living spaces, oversize bedrooms and cook’s kitchens, along with the luxury amenities found in a prestigious address.